After the hugely successful if albeit buggy Michael Jackson: The Experience, Ubisoft decided to take the experience part of both the name and game and add them to other artists or groups alike. Looking towards pop, rap, urban whatever they are nowadays group Black Eyed Peas to head up the next in The Experience line up of games. With a new developer on board though, have the problems from the first game been rectified at all? Or does the game still have huge problems keeping track of dance movements or making easy dance manoeuvres incredibly hard to pull off due to poor tracking? Will you be looking for some love from this game or just looking to put it in the bin? Let's take a look and find out! 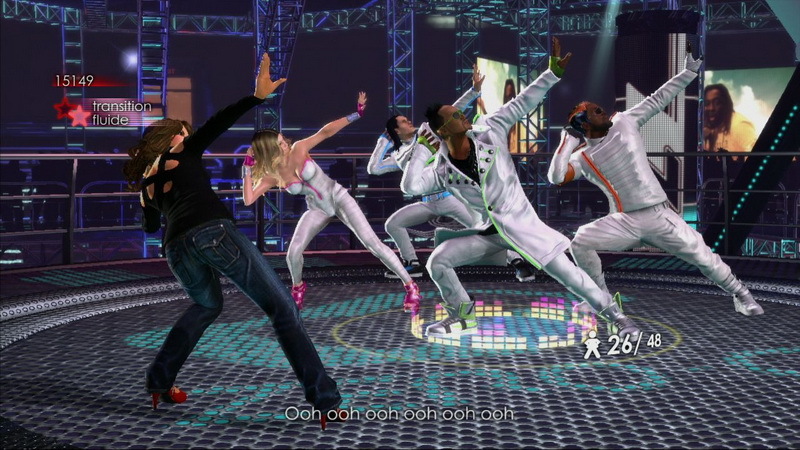 Gameplay For a dance game, The Black Eyed Peas: The Experience is pretty packed to the rafters full of content, let me start by telling you what modes you can play around with upon starting the game and delving into what toys are at your disposal. When you first get greeted into the game you will be able to select from the following options: Party Play: In this mode you will be able to just jump right into any of the routines included in the game without the need to sit through the song multiple times learning the moves. As the title says it is perfect for parties as you can play by yourself or against your friends in a dance off. Deluxe Mode: This is the games meat and bones if it were, here you will learn the full choreography of the multiple songs featured in the game, if that isn't enough for you, the choreography that you learn is comprised of real moves that the group perform to. Not only this, but Deluxe mode lets you unlock additional items, from clothing for your characters to extra arenas or arena upgrades. The better you perform the more followers you will get on your quest to be just like your heroes if it were. On the other end of the spectrum though you get areas such as My Dancer, here you can adjust your dancer to how you see fit and change multiple different items on them. The amount of customisable items is fairly large and only gets bigger as you unlock more. Lastly you can also make your own choreography from selecting from all the different moves in the game and piecing them together to create your own dance. You also have the ability to download your friends pre made routines and challenge them at their own dance to see who can come out on top. Onto the nitty gritty now, and some Kinect games have had issues when navigating menus, as sometimes the game can scroll too fast or too slow due to movements in the players body. On games like Just Dance this was rectified by letting the player use the controller to navigate freely if they so wished, unfortunately this is not the case in this game. You can use the controller if you so wish, but it is only locked off to certain areas of the game, such as making your own dance routines. To navigate the menus fully you will have to get prepared for some awkward movements and swinging your arm around to go forwards and backwards at times. This is slightly helped by the fact that when you are dancing away, for the first time that I have seen in a dancing game. The game comes with fully fleshed out and moving flashcards. These help the player work out what move is coming up and how you can perfect it before it is your turn to try it out. This was a great little feature that I personally enjoyed, far too many games use static flashcards that make no sense compared to the movements they are trying to depict, so to have the movements shown to you is a great improvement to the dance genre. Lastly, some of the moves that you will be asked to pull off in game can be justified simply as being tricky and will take a while to nail down the moves to perfection. This is only hindered by the games poor tracking at times which can make hard moves almost impossible when the game makes out that your movements are not correct when they are. The tracking does work on the game though and only a few times during a song may it say you disappeared or didn't follow the routine properly. Graphics When you first load up the game you will notice the great care for attention that was placed within the welcome screen and subsequent menu's. The menu system is pretty much a big dance floor that changes colour as you switch between all of the different areas of the game. With how good the menus look, it really helps set the mood for what you will be inevitably getting yourself into, it all fits into place rather nicely to boot. You wouldn't expect to see a multi coloured flashing dance floor if you had just brought the latest shooter to greet you on the menu screen. Overall though menu system aside the way the game has been laid out is really good even if navigating the menus can be a little awkward at times. In game the shine to detail shows through in the different areas that you will be dancing your way through also, whilst the arenas are all works of imagination, they all try to happily reflect different periods of time within the Black Eyed Peas lifespan. Subsequently though as the stages change, so do the attires of the characters or even the Peas to help reflect where you are in the timeline. Whilst some character models can look nicely remade, some on the other hand can look really stiff and frigid, Fergie's character springs to mind when talking about being stiff. The rest of the dancing as a whole is all well implemented and by using true choreography that the group use, you can feel like you are watching the group live instead of dancing next to them. All in all, whilst the game is presented nicely, some of the other graphical areas can all appear to be nicely presented whilst others just don't seem to get the job done correctly. Sound Music games are normally hard to sum up when giving a rating to this certain area of the game. Due to the game being about music, singing and dancing you have to ask yourself, What is there to talk about? The answer is quite simple, and by simple I mean short. Whilst playing this game you will no doubt come across many famous and well known songs from the groups long history. Most if not all of the bands most memorable hits have been included and to top it all off, hits from the groups previous years before mega stardom have also been included in the offering. Now depending on how well you know the group will obviously depend on how many songs you already know and or like. The Black Eyes Peas have gone through many musical styles in recent years since attaining Fergie to the group, so finding something you like shouldn't be too hard to achieve. The only downfall though to this is, not all of the songs listed in the game will be ones you will enjoy or want to dance to. If playing through a whole bunch of songs by the Peas isn't enough for you though, the group even lend some vocal talent into the mix as they will shout out random things whilst you dance away. These can range from being greeted to the dance floor by sayings like C'mon let's do it to challenges being issued by one of the groups members. All in all the sound package of the game is just what it is intended to be, you won't find any songs here by groups or artists who influenced the band like in Guitar Hero or other music based games, and if you don't like the Black Eyed Peas from the start then this game probably won't be for you. So that is supposed to be the Charlie? Achievements It appears more so now then ever with Kinect games, that the games themselves really do help define what the word achievement means when it comes to gaming as it were. Obviously with the motion tracking, that helps add a whole new element to how well the game can judge you and award you in turn. The achievements in this game help keep that in mind as the list itself is a real mixed bag of good and easy, and long and tedious. You have many achievements tied to progressing steadily through the game and earning fans and different ranks, from here on you can also work towards earning new locations that you can dance to or new customization options for your in game avatar. All of these different actions have achievements tied to them and like I say border on being easy for example. Playing a song in a specific arena to tiresome for getting to ten million followers. Just unlocking arenas will take a few hours of playing time, let alone earning all of the additional thousands worth of fans to go on top. Achievements are awarded for doing things a little away from the norm though, like for taking a look at the choreography area nabs you an achievement, and for making a set number of routines will get you another. Earning the maximum rank for each and every song on the game though makes a return, and unless you're really good at the game you may struggle to attain these, sometimes the tracking can make it hard for the game to properly score you meaning the scores you need to achieve an S rank will normally land you with an A instead. At the end of the day though this isn't a bad achievement list in the slightest. It is something to work towards over time and will go down a storm in a party atmosphere as you take on friends and colleagues, just don't expect the points to come at you thick and fast as you may be disappointed. Summary Black Eyed Peas: The Experience is a much better game then the Michael Jackson game that came before it, fine tuning and bug fixing has helped achieve this and it shows through no end. Obviously having a whole game devoted to just one band can be a little hit and miss when it comes to selling to the masses. But Uibsoft have managed to create yet another good dance game to go with the likes of Just Dance. Saying that though, personally the game reminded me way too much of Dance Central in the way it expects you to play and actually try to learn the routines as opposed to the Just Dance way of playing. If an option had been included that you could just dance in experience mode, without the need to play each song four times. Then this could have been a better and more fun experience in my eyes. If you are a Black Eyed Peas fan though and enjoy the club type tunes that the group put together nowadays, and are really interested in learning how to dance just like them. Then my friends this is the perfect game for you and will have you catered to the full experience!